The new Unique REVIVE programme which is personalized to you! 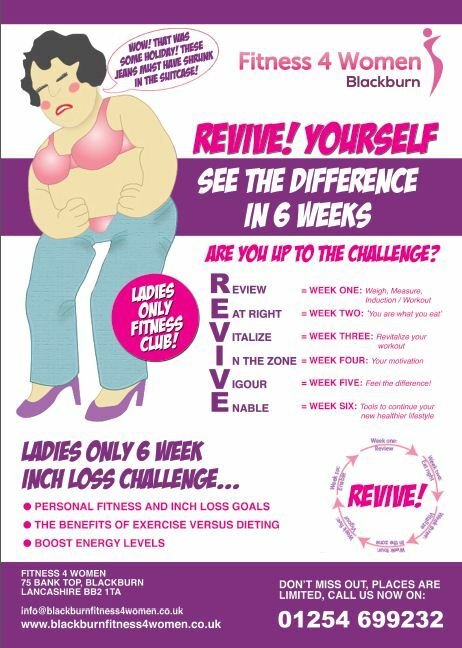 Blackburn Fitness4 Women is introducing a new Unique "REVIVE" your body 6 week Programme covering! The programme is suitable for ladies of all ages and fitness levels! This offer includes our unique 6 week "REVIVE" Programme - Gym - Fitness classes - Infrared Sauna - Steam Room - Vibrostation! The 6 week "REVEVE" programme can be used in many different ways which we personalise to you on your initial induction! Call now 01254 699232 to find out more! Want to know how to get the "REVIVE Programme" for FREE?